Geneva Fire Company - 100 years strong! The Geneva Volunteer Fire Company was formed in November 1902, with its first station located at the corner of Cushing St. and Union Ave. This was in response to the desire by owners of the Geneva Mills to have nearby fire protection. Horse-drawn apparatus was used for two decades, when a member's car was modified for use by the members and rigged to trailer the hose reel. This was the first motorized fire apparatus in North Providence. 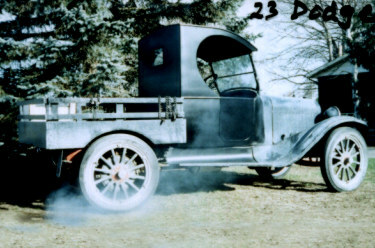 Shortly after that, a 1923 Dodge truck (similar to truck shown in photo) was purchased by the company and built into a piece of fire apparatus. The pump mechanism was a chemical one, i.e., a chemical reaction (probably soda-acid to form CO2) was initiated to create the pressure necessary to pump the water. The station was in use until 1927, when the current station was finished and activated. The previous one was added onto and is still in existence today as a private residence. The Geneva fire district was quarters to Engine 3, Engine 4 and the boat for many years, and today includes Engine 3 with a zodiac boat, and Battalion 1. Due to its central location in town, Engine 3 responds to virtually every structure fire and has thus served as an excellent means for on-the-job training for the department's firefighters. Also, many of the town's fire chiefs over the years were selected from Geneva.